Silver investing is on the rise by investors around the globe, although this precious metal always seems to be in the shadow of gold investment options. While both gold and silver have done extremely well on the market in the last few years, gold bullion has not increased at the rapid percentage that silver has. You can find silver bullion for sale at very affordable prices, while this may not be true of gold any longer because of the high price that this metal has already reached. Silver and gold bullion can both be excellent investment opportunities, but you will be able to get a better return on a dollar with silver than you will with gold in most cases. While the focus has always been on the yellow precious metals, many investors fail to notice that its silver counterpart can double or even triple your returns at favorable down market economies. With exorbitant gold prices we are seeing now, you are very unlikely to see any gains. With its counterpart on the other hand, the potential is very strong for many reasons. It has extensive industrial applications like in the production of electronics, self sustainable solar panels energy sources, automobiles and many more. 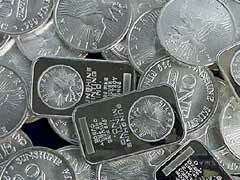 A silver bullion investment can be accomplished in many ways. You can choose from coins, bars, stocks, mutual funds, and all the other options that are available with gold. Some experts predict that by the end of summer silver investing will reach prices of twenty dollars an ounce, but there is no guarantee that this will happen. Gold has been the most popular metal traded until this point, but most investors are starting to look at silver investing as well for a number of reasons. This precious metal is starting to come out of the shadow and shine. The increased popularity of silver investing is caused by the same reasons that gold and other precious metals have become more valuable. Silver bullion coins and bars are seen as safe and low risk options, at a time when many other investments have more risk than usu . An increase in the use of this metal in the manufacturing sector has increased the demand, as well as the value. Many investors have started silver investing in the last few years because they recognize the potential that this precious metal has. Normally all precious metals are affected, so when gold rises or falls then silver usually follows.